AUGUST 2017: My approved digital design for “Return of Nossa Senhora,” a stained glass window for the Nossa Senhora da Piedade Church in Itaparica, Bahia, Brazil. (l-r) Google earth image of the Church, measuring the window, and the church from the distance, with my (digital) design. SEPTEMBER 2017: Renovation of the front of Our Lady of Mercy church. 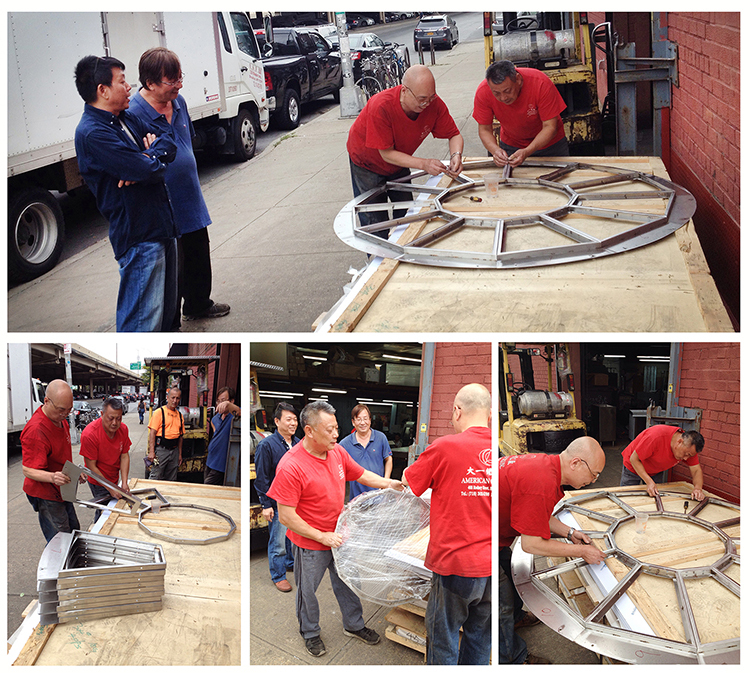 After the window area was measured and design was approved, my favorite metal company in Brooklyn made the stainless steel frame. It comes apart into 13 pieces. I am Joseph Cavalieri, a New York City artist. I am currently designing and making a six foot round stained glass window for Our Lady of Mercy Church in Itaparica, an island off the city of Salvador, Brazil. The Church was built in 1923, with an area for a stained glass window. At that time, the members of the Church could not afford to include a stained glass window; today the cost is even more prohibitive. However, with design approval from the head of the Church, I am volunteering my time and creativity to provide the long overdue window while Sacatar Foundation is contributing a much appreciated work space, housing and meals for me. Despite all of this cooperation, I still need funds for purchase of the stainless steel frame, glass, solder, and lighting. I will be spending October and November of this year in Itaparica to make and install the window. I will be adding to this blog with photos and information on the project. This is a decorative design with a central figure of Nossa Senhora da Piedade (Our Lady of Mercy). It has strong colors so you will see it clearly from the distance. It is made of colored stained glass that will be set into a stainless steel metal frame. It will be back lit with LED lighting. The blue glass color relates to water, ocean, sky, and the color of the front door. The orange and yellow colors relate to the sun and the color of the outside of the church. The border has waves of water to relate to the ocean. The central figure is a portrait of the original Our Lady of Mercy statue that was stolen from the church in 2011. This stained glass window is a way to bring her back to the church and the community of Itaparica. Our Lady of Mercy is the Patroness of Itaparica. This work relates to the history of this Neogothic style church. The location is in the historical center of Itaparica, and island off of Salvador Brazil, in the state of Bahia (population 55,000, area:146 km / 56 sq mi). The original construction was in 1854. The church was rebuilt in 1923. Our Lady of Mercy had fought to defend Itaparica. For that reason she became the patroness of Itaparica and the first chapel in honor of her was built in 1923. This chapel was built as a monument of gratitude to Nossa Senhora and the independence heroes, whose names are written on the church facade. Sacatar Foundation, Greg, Archie, Stan, Thomas & Annette, Dita & Dave, Fred & Susan, Cousin Midge, Cousin Connie, Bob, James, Jennifer, Seth & Sarah, Fred & Sharon, and HITlights LED, and last but not least my family: Peppy-Jo, Rita, Patty, and Johnny & Annie.